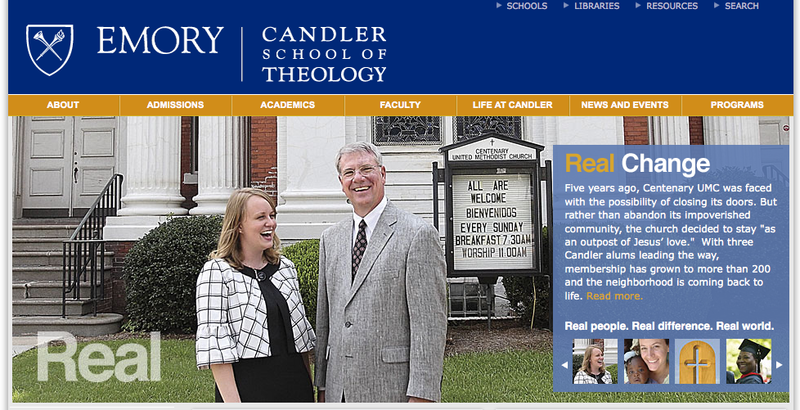 Here's a recent view of the Candler School of Theology home page that uses a photograph I took for their "Real People" campaign. The emphasis is on the way Candler prepares real people to make a real difference in the real world. Stacy Harwell (above left), a friend of mine and recent Candler grad, serves as a minister at Centenary Methodist in Macon, along with Tim Bagwell (above right) and one other Candler alumni. Stacy and Tim are two of the real people featured in Candler's Real campaign.